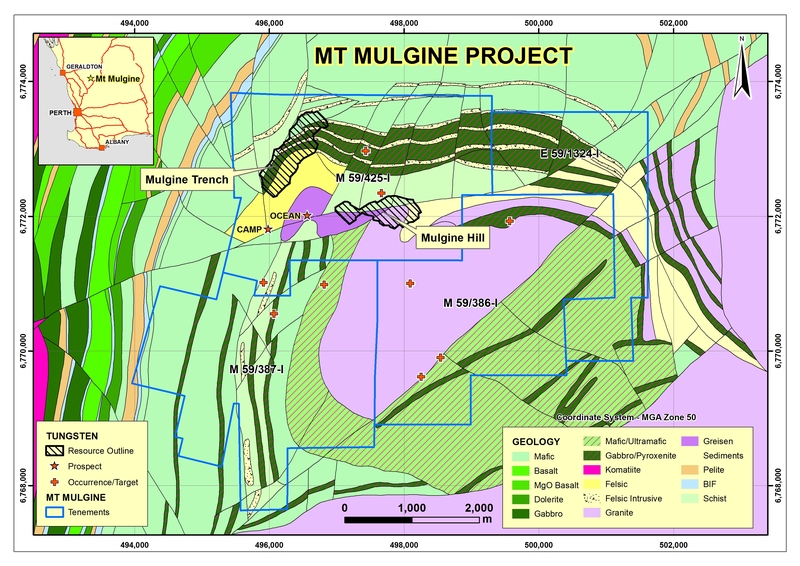 The Mt Mulgine Project is located within the Murchison Region of Western Australia, approximately 350km north northeast of Perth. Tungsten Mining has 100% of the tungsten and molybdenum rights on a contiguous group of tenements that have been the subject of significant previous exploration for tungsten and molybdenum. Two near surface JORC 2012 compliant Mineral Resources have been delineated by previous explorers at the Mulgine Trench and Mulgine Hill deposits. Currently, there is a combined Mineral Resource of 70.9Mt at 0.18% WO3 (0.10% WO3 cut-off) and 230ppm Mo. A breakdown of this resource is presented below in the JORC Resource Statements section. Historical metallurgical testwork conducted in the 1970s/1980s indicates tungsten is present as coarse-grained scheelite that will respond well to conventional gravity separation and is capable of producing saleable concentrate. Tungsten Mining is implementing a staged approach to the development of the Mt Mulgine Project that will support low capital start-up costs, directed at demonstrating a pathway to positive cashflow for the project and in turn, Tungsten Mining’s shareholders. The Company is implementing its strategic Development Plan for the Mt Mulgine Project, focussed on production from Mulgine Hill. Substantial work has been completed and is described more fully in the Company’s quarterly reports and ASX Announcements. Tungsten-molybdenum mineralisation at Mt Mulgine is associated with the Mulgine Granite – a high-level leucogranite forming a 2km stock intruding the Mulgine anticline. The granite intrudes a greenstone sequence composed of micaceous schists, amphibolite and talc-chlorite schist, which were formerly metasediments, mafic and ultramafic rocks respectively. • Porphyry-style molybdenum-only mineralization in the core of the granite. • Principally tungsten mineralisation with accessory molybdenum, bismuth and fluorite at the Mulgine Hill Prospect on the granite contact. • Tungsten and molybdenum mineralisation with accessory precious metals at the Mulgine Trench Prospect. Exploration potential is excellent with numerous open positions at Mulgine Trench and Mulgine Hill. Note: Totals may differ from sum of individual numbers as numbers have been rounded in accordance with the Australian JORC code 2012 guidance on Mineral Resource reporting. A Metric Tonne Unit (MTU) represents 10 kilograms of WO3.